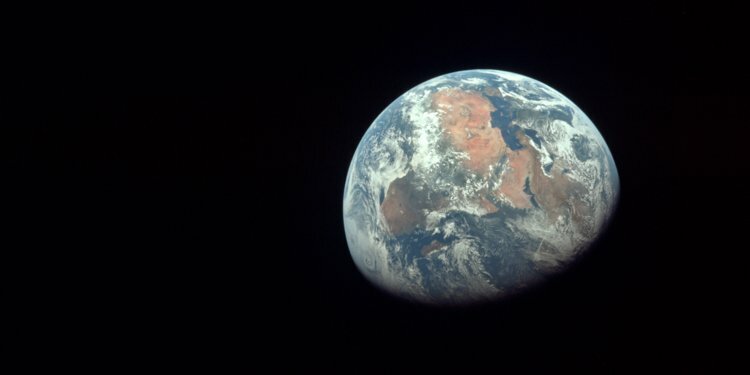 I remember being enthralled as a small boy by the Apollo missions (which first produced this view of the Earth from space) and by the moon landings in particular. Here is the latest video from Speak Life released for this Christmas. It tells the remarkable story of the men who travelled to the moon and the even more remarkable of the Man who travelled to the earth. Have a look at it now and share it with your friends about it. 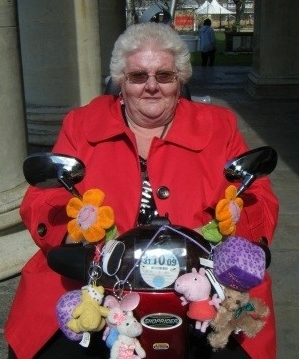 She was a St James's regular, a stalwart, that familiar smiling figure in her place at the back of church on her motorised scooter, dishing out cheery 'hello, loves' to all and sundry. Today we said goodbye to her. We remembered her love of her family and her husband Joe, her love of dancing, and her involvement with C.U.M. (now Salmon Youth Centre). We remembered that special day when she was confirmed - I have the photo on my study wall above my desk of all the candidates with the bishop, and right in the centre, beaming, is Jean herself. 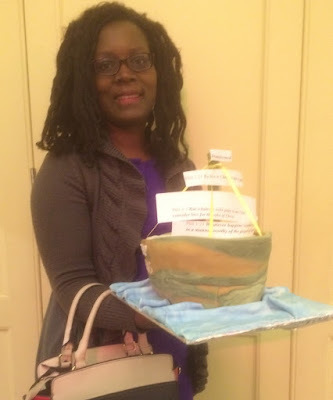 For years she had thought she wasn't 'good enough' to be confirmed but then she took the plunge and what a difference it made to her to be confirmed and receive communion. It made her feel fully part of the family, Jean told me, which, of course, was exactly what it (Holy Communion) was designed to do. We shall miss her but we thank God for her. 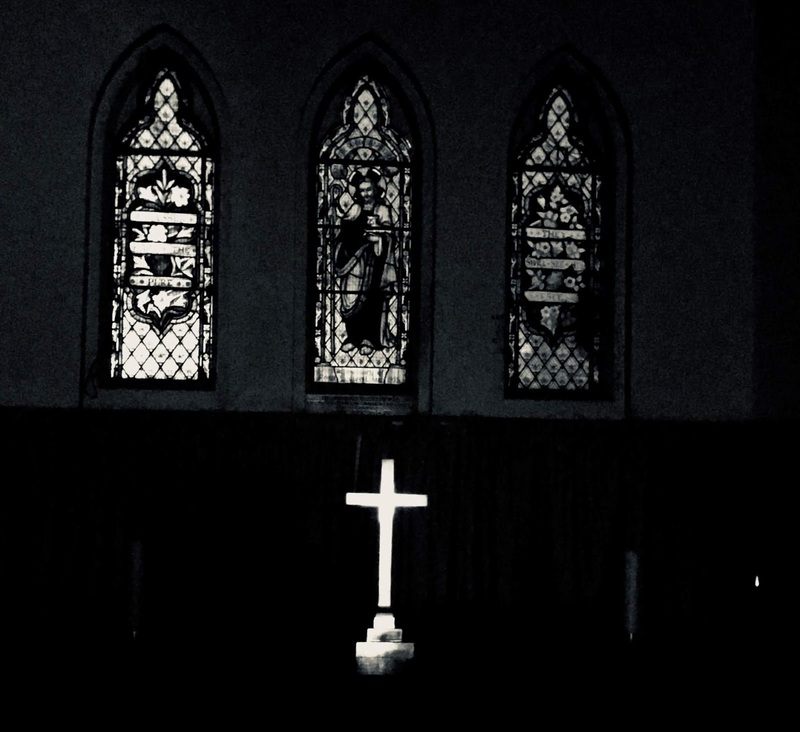 Atmospheric shot of St Anne's at night taken by churchwarden Graham. 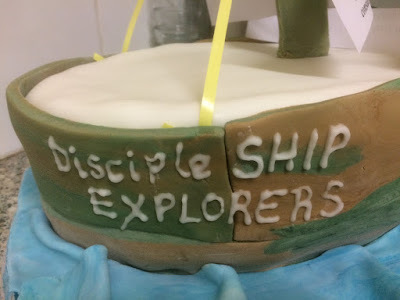 Our Discipleship Explored course came to an end last night at St James with session eight of our studies in St Paul's Letter to the Philippians and an early Christmas Dinner, with turkey, mince pies and all the trimmings. Here is course member, Asha, with the cake she baked for the occasion - in the shape of a ship. Thanks Asha for your lovely gift which rounded off a wonderful evening for us all. We're having a break for Christmas now but a new Wednesday night course starts on 23rd January. 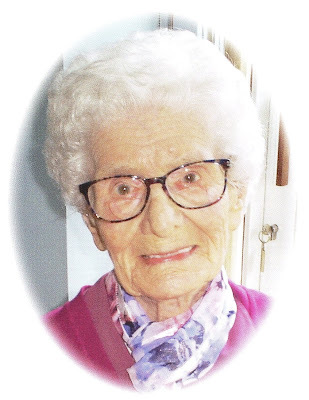 When Lillian at the age of 93 asked Stewart, my predecessor as vicar of St James, if he would take her funeral, he wasn't expecting that it would not be for another eight years - but in the plan of God it was. So today we had the joy of welcoming Stewart and Rosemary back to Bermondsey as we bade farewell to a remarkable lady. Lil was 101 years old and a life long resident of Bermondsey. From the age of 4 she was a member of the Gedling Mission in Bermondsey. 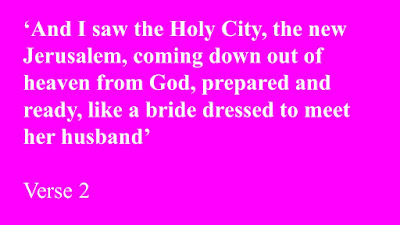 She met her husband there and she continued a faithful member of that congregation until the mission closed a few years ago. She remained a firm, clear, joyful Christian until the day she died. Today we gave thanks for her life in St James's Church, where her husband's funeral had taken place, and where she was a regular member of our monthly Monday Fellowship. They did it to the very end of their long lives. Now they are both with the Lord they loved and we thank God for every remembrance of them. 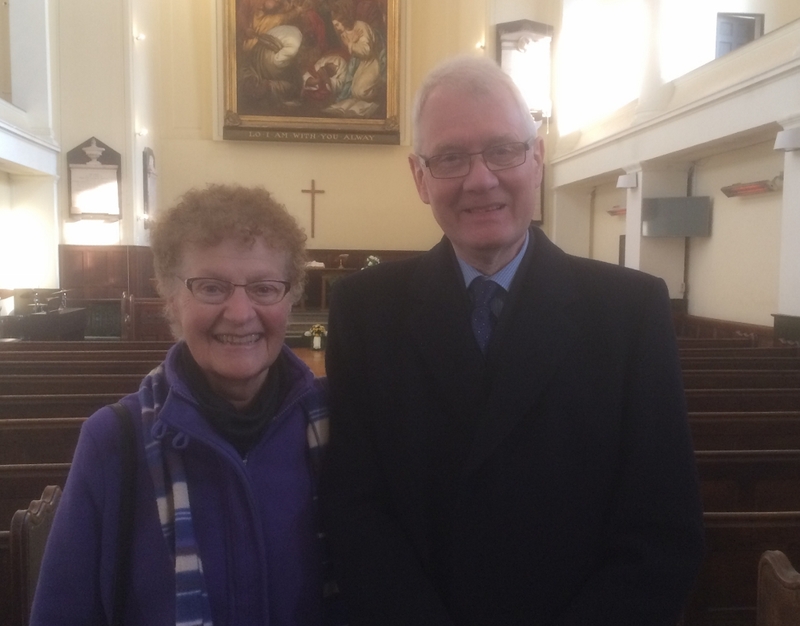 Penny Molyneux (on the right) receiving a Long Service Award today in church from Marion Watson, representing the Southwark Diocesan Association of Readers. Penny became a Reader twenty five years ago and has been our Reader here in Bermondsey for the last fifteen years. Today was an opportunity to say a big thank you to Penny, for her upfront work of preaching and teaching, and her work of caring and encouragement that so many have benefitted from, not to mention all her work for so many years at St James's School. 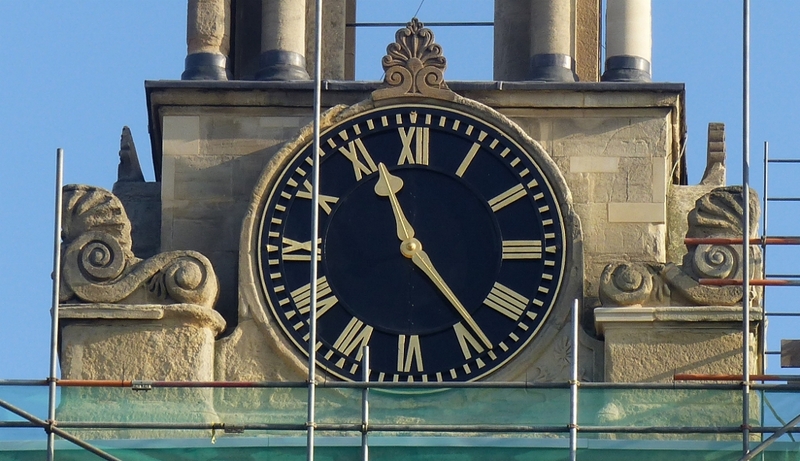 With the scaffolding starting to come down from St James's belltower, the restored clock faces can be seen in all the glory - and the clock is once again telling the right time. Very soon it will start chiming the hours again, too. 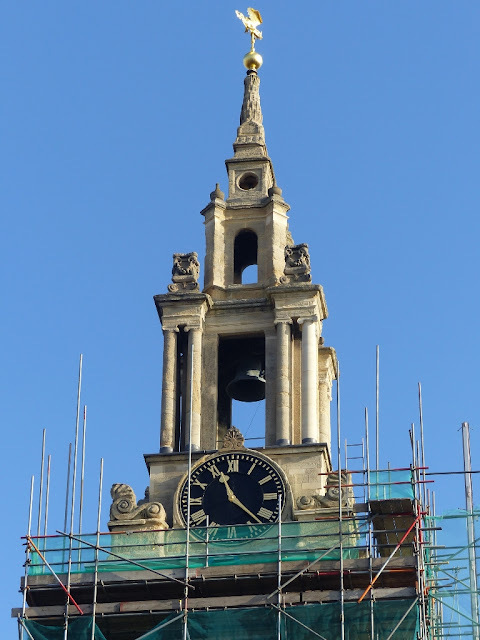 The four clock faces hav been completely stripped back and painted; the numbers have been regilded; and the clock mechanism has been overhauled, all thanks to a grant from the Heritage for London Trust, who also funded the restoration of the dragon weathervane. Sir Simon Hughes; the head boy and head girl of St James's School; vice-chair of the school governors, Jim Hutchinson; and the vice-chancellor of London Southbank University, at the recent installation of Sir Simon as chancellor of LSBU. 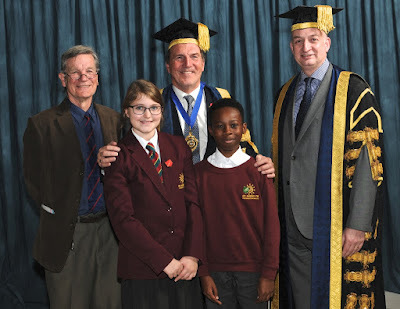 Yesterday evening governors and friends of St James's School gathered to say thank you to Sir Simon Hughes for his 24 years service as a school governor, during which time he has been our devoted and enthusiastic Chair of Governors. Here is Simon receiving from Acting Chair, Jim Hutchinson, a thank you gift from the governors of two historic prints - the first of Southwark Cathedral and the second (shown in the picture) of a nineteenth century parliamentary hustings in Southwark, the two gifts symbolising Simon's active involvement in the religious and political life of our community. There are many things that I have appreciated about Simon's service to our school, but there is one thing that was in my mind especially last night. 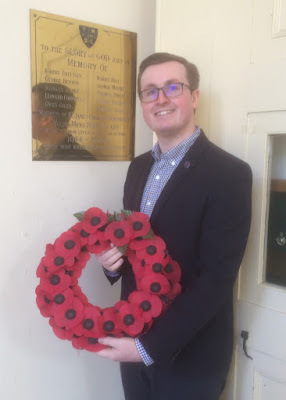 It is that event that Simon has attended without fail, even with his many responsibilities as a Member of Parliament and, eventually, as a Government minister, and that is our Annual School Leavers service in St James's Church held each July on the last day of the school year. 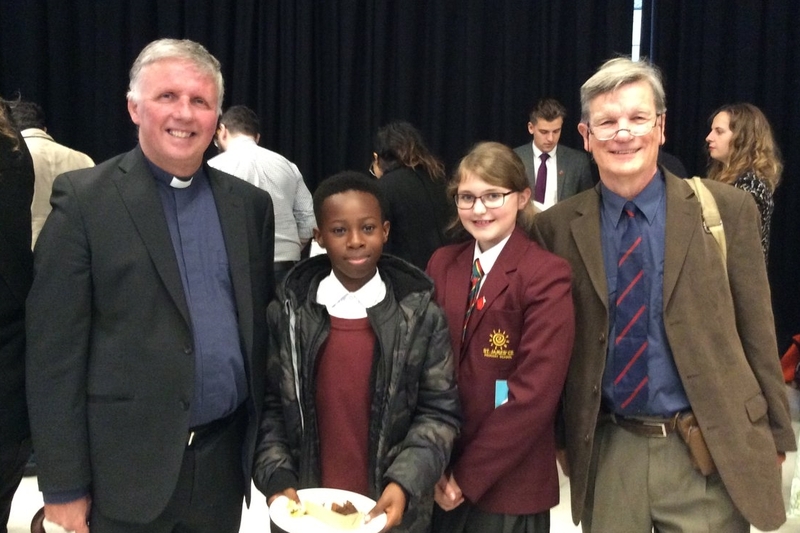 Bibles and other gifts are presented to each leaver personally by Simon in front of the whole school. What really strikes me is the time that Simon takes in doing it. He is not content with a brief handshake, but says a few words of encouragement to each child individually. Simon demonstrates what all of us involved in education actually believe, namely, that the children are the most important people in the school. It is their school. It exists for them and to give them the very best start in life that is possible. Simon by his actions showed us that every child mattered. That each individual was a precious person, made in the image of God. His actions and his dedication to the school, made me think of those words of the Lord Jesus, which are surely the inspiration of every church educator: 'let the children come to me and do not try to stop them, for the kingdom of God belongs to such as these' (Mark 10.14). So, thank you Simon, for all you have done for St James's School. The First World War started on 28th July 1914 and ended exactly a hundred years ago today on 11th November 1918. 70 million people fought in the war. 9 million combatants and 7 million citizens died. Here (above) is a famous photo from 1914 of the Bermondsey Boys taken at the Wellington Barracks in London. 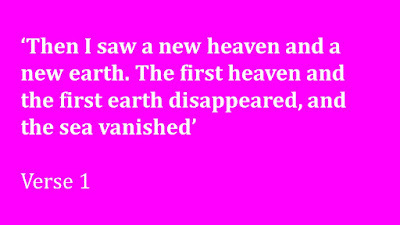 How many of them returned? We don’t know. 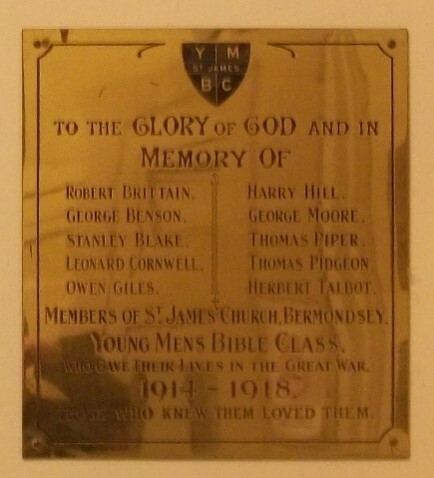 What we do know is that no less than ten members of the St James Bermondsey Young Men’s Bible Class gave their lives in the conflict between 1914 and 1918, and are commemorated by this brass plate in our church narthex. 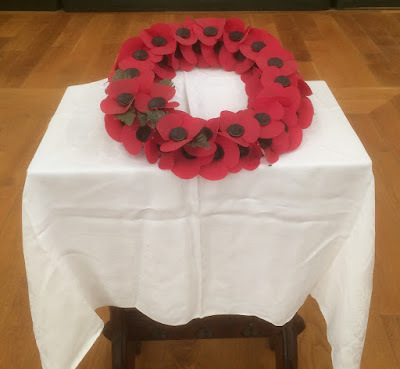 Today we remember them: Robert Brittain, George Benson, Stanley Blake, Leonard Cornwell, Owen Giles, Harry Hill, George Moore, Thomas Piper, Thomas Pidgeon, Herbert Talbot. Under their names on the narthex memorial are these heartfelt words: Those Who Knew Them, Loved Them. And the same could we said by the families and friends of the 16 million who died in the First World War, the 50 million who died in the Second World War and the thousands of who have died in subsequent conflicts. The scale of the suffering is more than we can take in. And much as we honour and remember the sacrifice of those who gave their lives for the freedom we now enjoy, we must wonder whether there is any end to war, to the pain and suffering this troubled world? 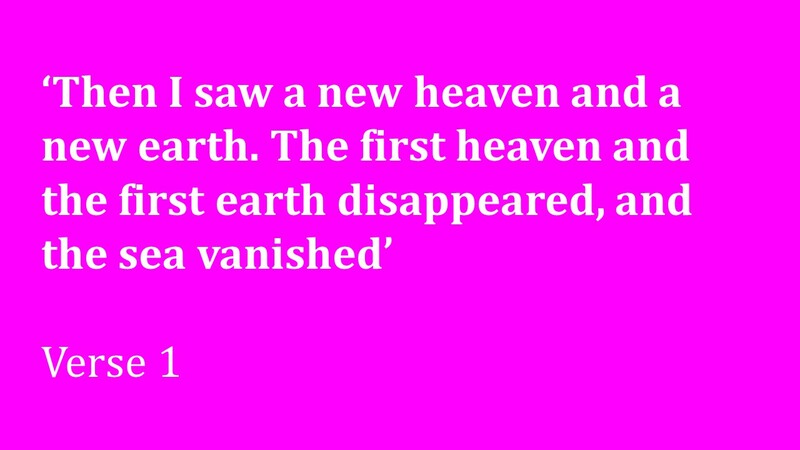 John sees a whole new world, a wonderful replacement for the damaged, polluted, war ravaged, fallen and broken world that we live in. 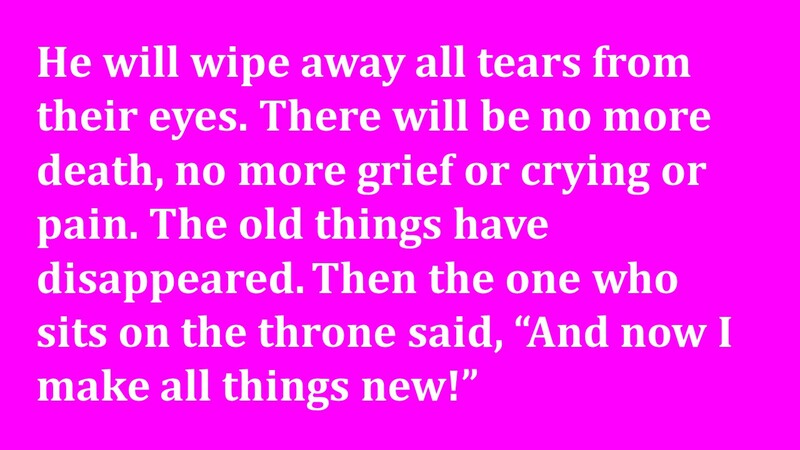 And it a lovely picture of the tender love of God we are told that He will wipe away all tears from their eyes. How we need to hear that message on Remembrance Day. 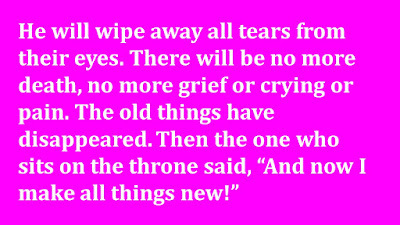 How we long for that day when God wipes away every tear from our eyes. ‘It is done’ All God’s purposes have been accomplished. 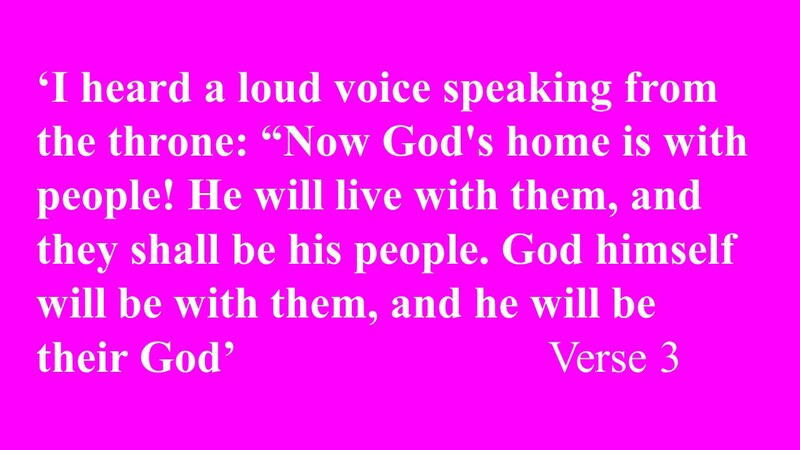 All God’s promises have been fulfilled. The great act of redemption and re-creation has been completed. It is available to everyone who knows their need of it – ie who is thirsty. Have you responded? 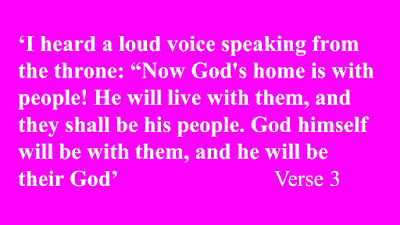 Have you come to the reigning Lord who has done everything for your salvation and now calls you to come to receive it? 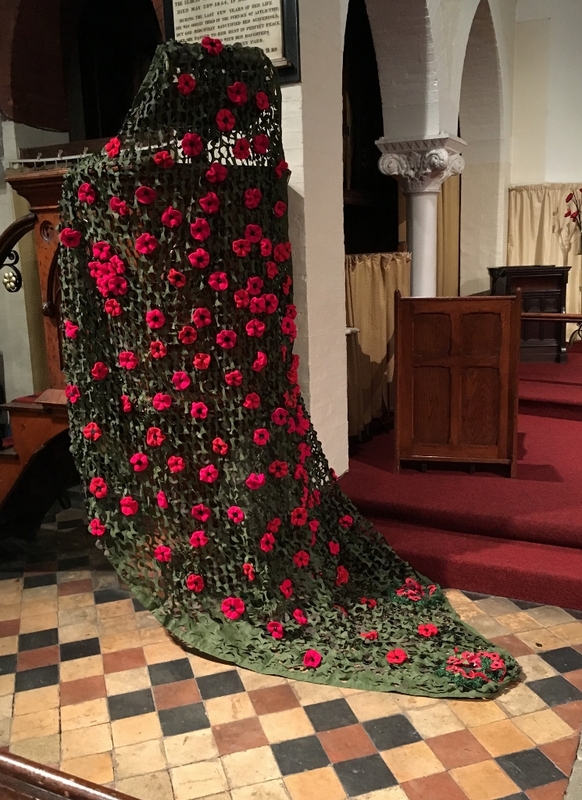 Here at St Anne's (left) is the magnificent veil of knitted poppies made by St Anne's members and their friends for today's Remembrance Sunday service and Commemoration of the Centenary of the End of the First World War. 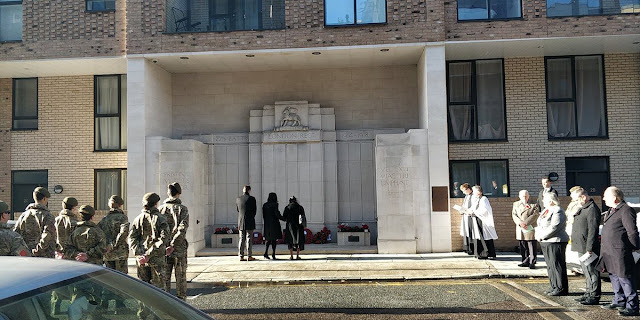 In Old Jamaica Road at the memorial of the Queen's Regiment, where the names of over 900 Bermondsey men who died in the First World War, are inscribed, we has our traditional Act of Remembrance in the presence of veterans, the Army cadets, local residents, councillors and former MP, Sir Simon Hughes. There was a bumper turnout this year, perhaps in view of the WW1 centenary. In St James after the service we laid a wreath of poppies at the Boer War Memorial and at the Memorial to the ten members of the St James Church Young Men's Bible Class who gave their lives in the 1914-1918 war. Here is Michael, one of the young men currently in the congregation, laying the wreath to the members of the Young Men's Bible Class. 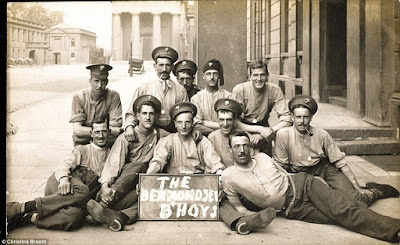 That was true of course not just of the ten lads from St James, but of every one of the sixteen million who died in the First World War. The scale of the suffering and the grief that followed is literally unimaginable. But each person who died was a precious person made in the image of God. 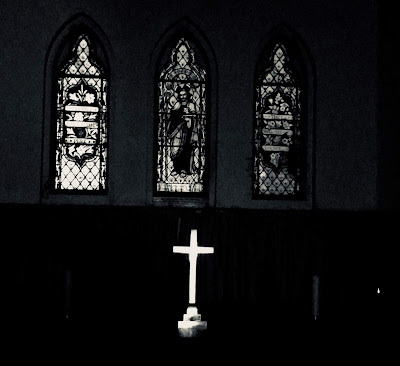 Each of them was loved by their families and precious to them, and that's why it is good each year to remember, and then to hear God's message of comfort and hope from his word. Like churches all over the country, St James and St Anne's, will specially be thinking this Remembrance Sunday (10am at St Anne's; 10.30am at St James) about the centenary of the end of the First World War which took place at the eleventh hour, of the eleventh day, of the eleventh month of 1918. 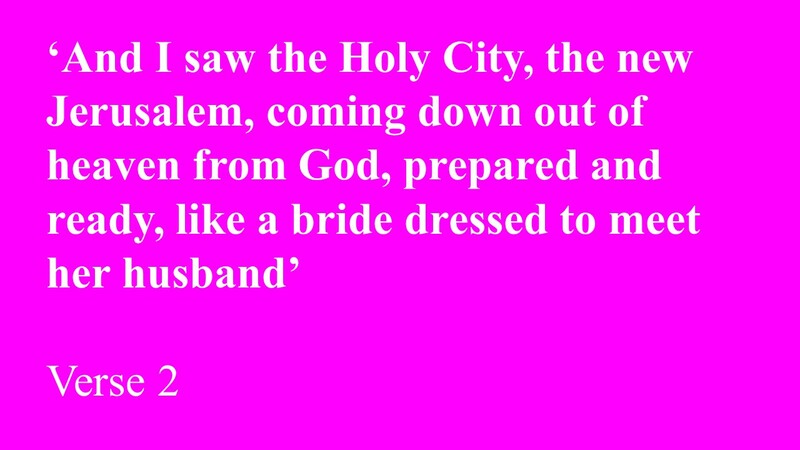 Here is a taster of part of a video from the Bible Society which we will be showing in our services. From St James School Twitter Feed: Two Year 6 children accompanied Governors Jim Hutchinson & Gary Jenkins to Sir Simon Hughes' inaugaration as Chancellor of London South Bank University. It was a proud day, especially when Hannah & Nathaniel received a name check from the man of the hour! Congratulations to all! 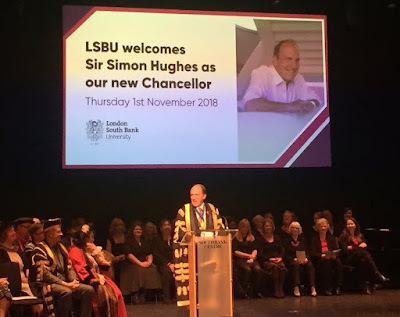 Bermondsey's very own Sir Simon Hughes was today installed as the Chancellor of London South Bank University. 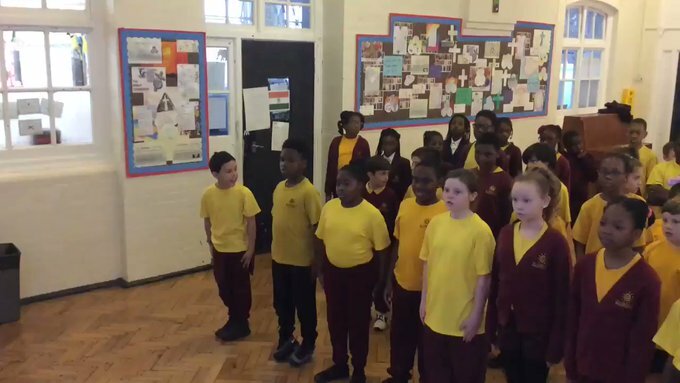 It brought together some of his great passions, south London and the cause of education. 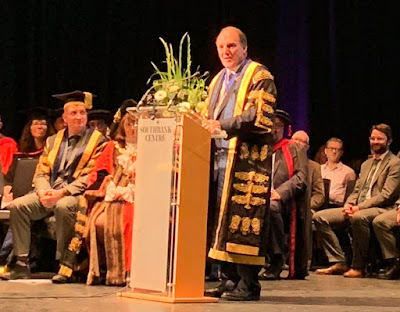 The ambassadorial role of the chancellor will play to one of Simon's great strengths - his amazing ability to network and connect with all kinds of people in all walks of life. An enormously wide range of people had been invited by Simon to the event - from the community in Bermondsey, from Parliament, from other places where he had served and lived, including MPs from all three main parties, Lords, Ladies, and an Olympic champion. It was a very special occasion, a mixture of formality and informality, all marked by that wonderful Hughes care and concern for everyone. 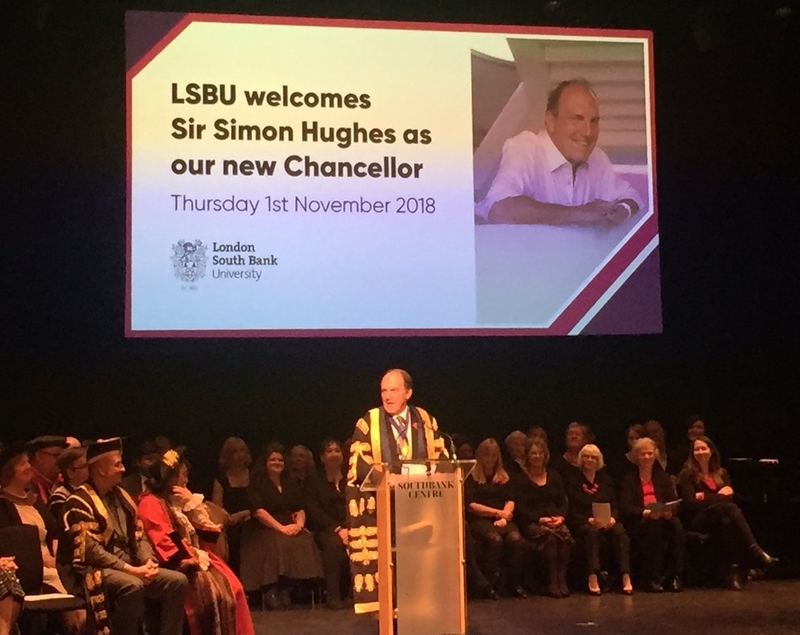 LSBU have a worthy ambassador for their university in their new chancellor.